While the world may be shifting rapidly from face-to-face interactions to online, virtual and real-time technology, one traditional industry that has remained relatively consistent is that of truck driving. In fact, with the increase in things like online shopping and the onset of retirement for many older drivers, there is more of an opportunity now than ever for those with the necessary skills to make an incredibly lucrative career out of driving a truck. If you’re in the market for a new job or are thinking about making a career change, becoming a truck driver might be the ideal solution. In recent years, the shortage in qualified truck driving professionals was masked by the recession. Because consumers were buying less and those in other industries, such as builders, were hauling fewer materials thanks to the collapse of the housing market, the trucking field was also impacted. Since then, however, the economy has resurged and truck driving demand has subsequently increased. As a result, the American Trucking Association (ATA) estimates that there are some 30,000 to 35,000 unfilled truck driving jobs in the US alone. In reality, there has always been a shortage, but with the economy in full gear, it’s never felt as significant as it is today. Couple this with the incredibly high turnover rate of drivers who work for large carriers, which is estimated to be about 130%, and the shortage can be felt across the board. As a result, many trucking companies are relying on external resources, such as recruiting firms, as well as working with truck driving schools to help fill their available positions. Many students are able to secure a future job driving a truck before they even earn their commercial licenses. One of the biggest challenges the trucking industry is facing today is attracting younger drivers. Many up-and-comers simply don’t find the idea of driving a truck appealing, particularly if it involves any type of long-haul or sleep-away schedules. The answer to these struggles has come in the way of new and improved truck design with features that specifically address the issues of efficiency and comfort. 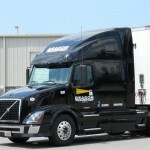 Many new trucks also feature technology that allows for enhanced, real-time communication. Of course, all the bells, whistles and luxury amenities may still not be as persuasive in luring younger individuals into a truck driving career as much as the pay itself. The good news is, thanks in large part to the significant shortage and increasing demand, an entry level truck driver today has the potential to earn up to $50,000 a year. Those who take the next step and learn a specialty can see that salary go up to $70k and above. The reality is that the trucking industry is ripe with opportunity, and given its current state, the demand for drivers will likely only increase over the next several years (along with pay, benefits and a host of other perks). If you’re considering a truck driving job, now is an excellent time to jump in and get started. To learn more about our available positions in logistics and transportation, contact our recruiting department at 877-277-0238 x 231.